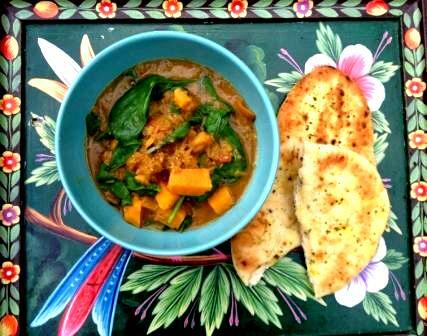 In honour of National Curry Week, here’s one of my favourite veggie curry recipes. Super quick (I’m talking under half an hour here), cheap and delicious, it’s perfect for an easy week-night dinner. I learned how to make this from a friend in Bangladesh, where leafy greens, potatoes and lentils are some of the only ingredients that are available year round. You can make this with whatever root vegetables you have to hand – carrots, turnip, regular potatoes – and also with any kind of squash. We usually eat this with rice and a sharp raw tomato and onion salad. Tastes even better the next day. Heat the oil in a heavy-based frying pan until hot, then add the onion and fry until its thoroughly browned. Add the garam masala and turmeric, and stir until the onion is coated in the spice mix. This should only take about 30 seconds, otherwise the spices will start to burn. Tip in the chopped tomatoes and chilli, and stir until thoroughly combined. Next, add the lentils, stirring them through until well-combined with the other ingredients. Pour in the hot stock, turn up the heat and bring to the boil. Once boiling, turn down the heat, cover the pan and simmer for 10 minutes, until the lentils are soft. Add the sweet potato, and let the curry simmer for a further 10 minutes until the potatoes are cooked (they’re ready when they give to the point of a sharp knife – you don’t want mush). When you’re ready to serve, put the spinach on top of the curry and cover with a lid for around 1 minute. When you take the lid off, the spinach will be bright green and wilted, and ready to stir through.